Given that the image can be viewed as a continuous function in 2 or 3 axes we have derivatives that can be taken of the images. The derivates determine the maximum and minimum of this changing function. 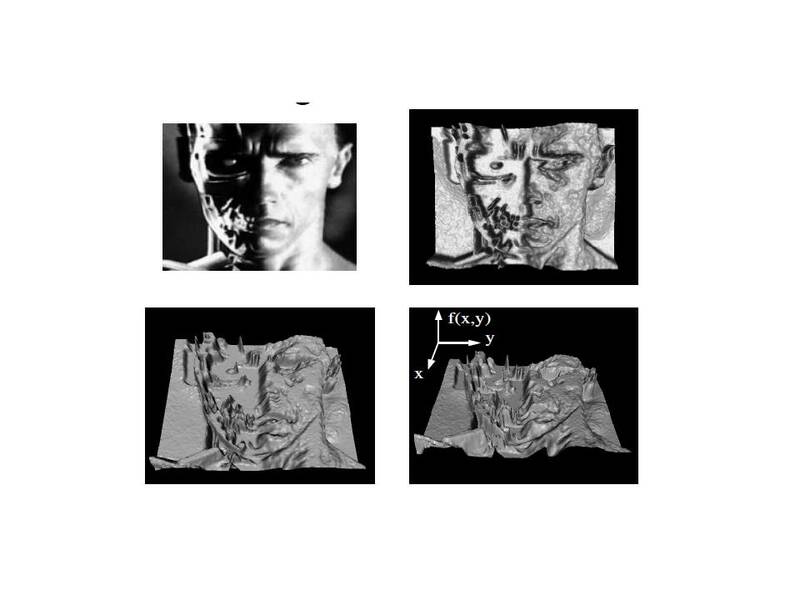 The key derivatives in image processing are the Sobel, the Scharr and the Laplacian filters. These provide the 1st order or 2nd order derivative and hence can be used for determining edges of an image. I was keen on playing around with derivatives and also understanding how the histograms look like. 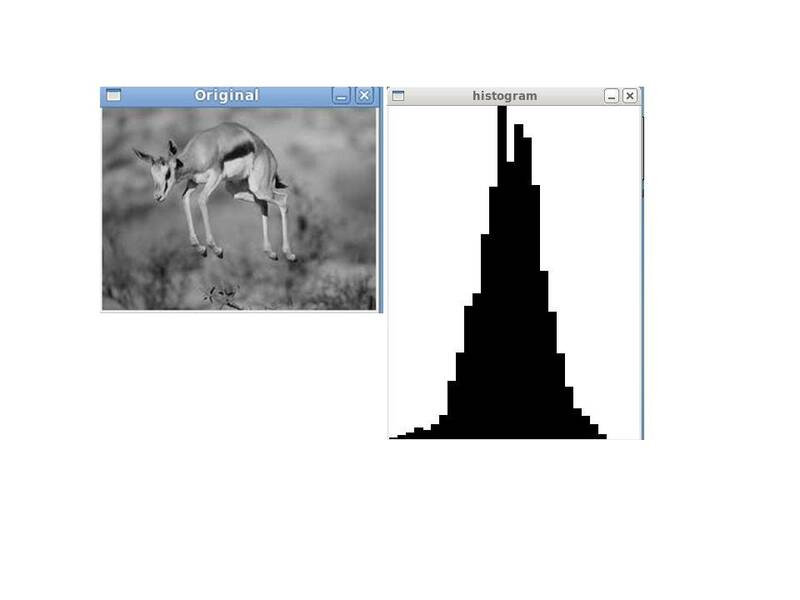 Here is the original image and its histogram. Clearly there is a nice spread of the values. The output of the Sobel filter on the original image is shown. The edges with Sobel’s derivative somehow are not too pronounced. The Sobel derivate can be used for obtaining the gradient of the image. 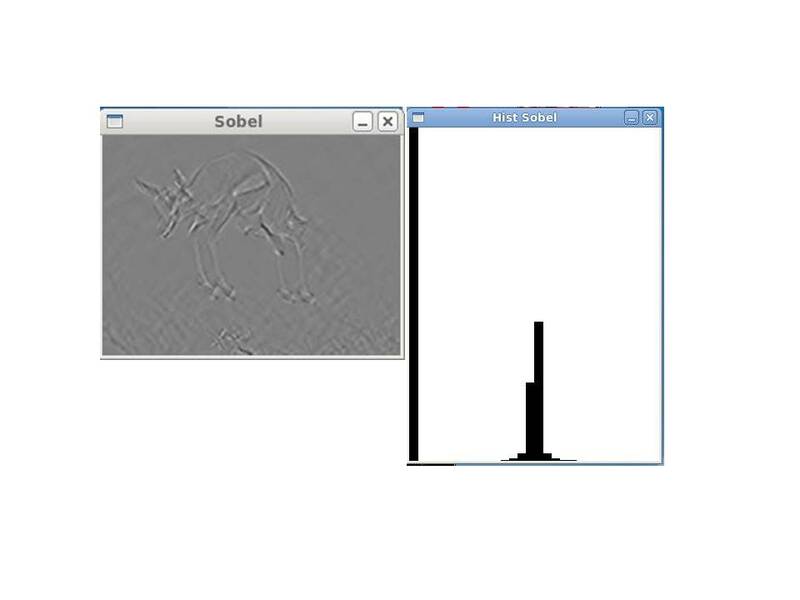 The corresponding histogram of the Sobel’s gradient is shown. The Laplacian provides the 2nd order derivative and hence can be used to determine local maxima and local minima. 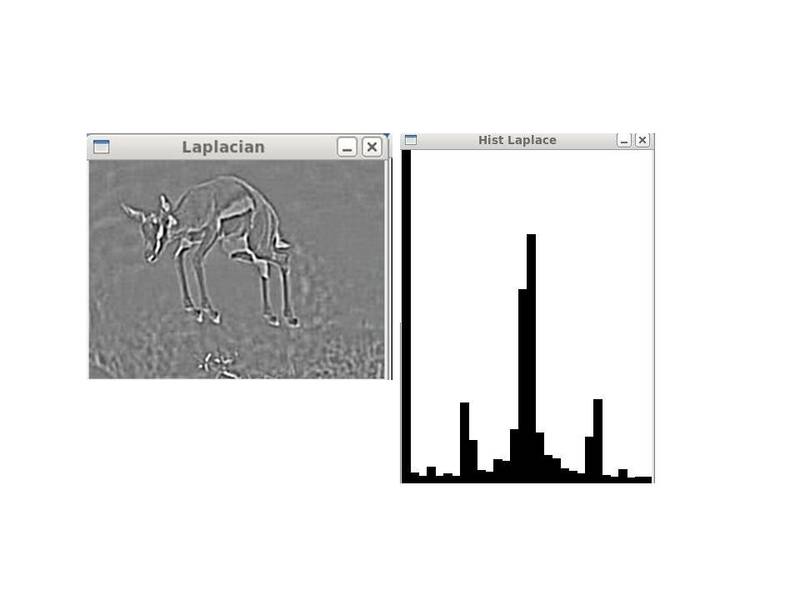 The Laplacian provides for much more pronounced edges and can be used to extract features of an object of interest. Its corresponding histogram is also included. The third filter is cvCanny which is most suitable for obtaining clear edges in an image. 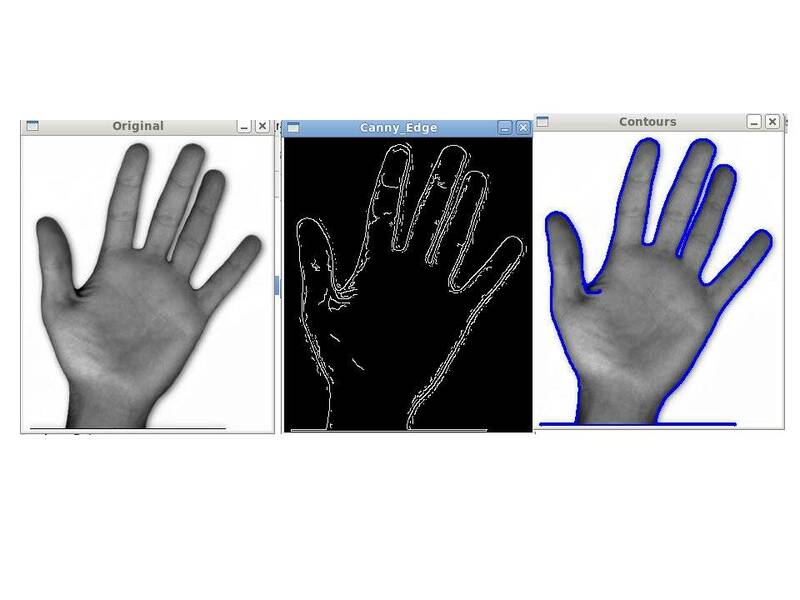 The canny is usually used along with cvFindContours to determine the general shape of an object. I used the canny filter which I passed to a contour detecting function. 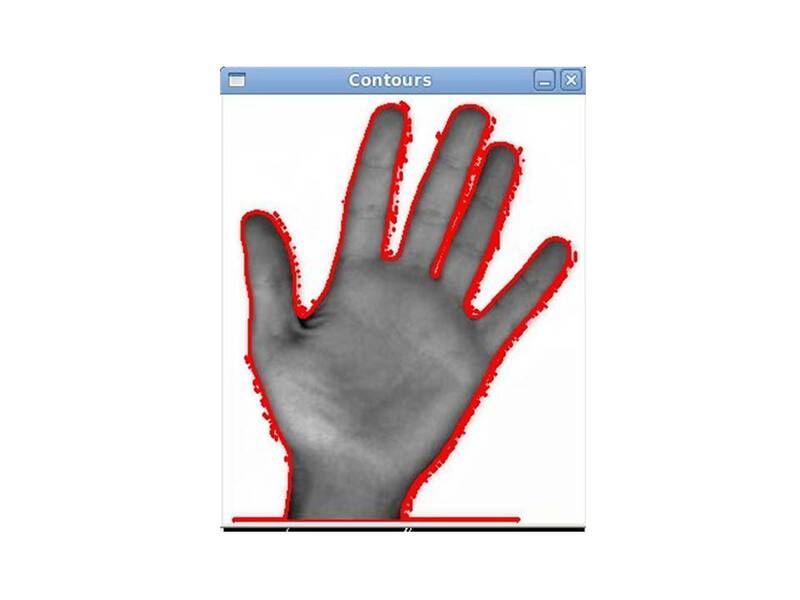 However the contour detecting function identified more than 228 contours most of which were useless except for 1 which had included the complete contour of the hand as shown. However when I increased the max_depth to 1 I found that it was immediately able to get the complete contour of the hand besides a lot of extraneous contours. I guess the challenge with the contour function is being able to programmatically reject all those contours which of lesser importance (possibly a future post). I have been working with opencv for a little over a year (this blog has often been very helpful) and have run, far too often, into the problem you mention of being able to programatically reject (with a good enough accuracy, say >95%) the useless countours or lines (when using houghlines) I have a couple of implementations to help me achieve such a goal but most hover at the 85% accuracy mark. If you are serious about coming up with a reliable mehod or algorithm and would like some help do let me know, you can contact me at: jaime_apATyahooDOTcom.